It's wheels down one last time for Endeavour. 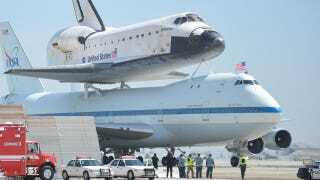 Following a cross country trip that began three days ago in Florida, the iconic Space shuttle (the last to ever take flight) has landed at Los Angeles International Airport atop NASA's Shuttle Carrier Aircraft. As collectSPACE.com's Robert Pearlman points out, the spacecraft's final landing represents not only the end of Endeavour's journey, but "the final ferry flight of the space shuttle program era."